A commercial premises in Reading needed a bit more light and ventilation into their offices but with the added security of grills, fitted so that they could open the windows. Garry thank you so much for the work and for getting it done so promptly. Your guys have done a great job and it makes such a difference. It all looks so spacious. Now it is all decorated and flooring down it all looks great Kate is moving in this week end, she is very excited and pleased to be in well before Christmas. 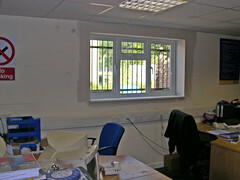 The work had be carried out over a weekend when the office was not in use and completed so as not to disturb work the following Monday.